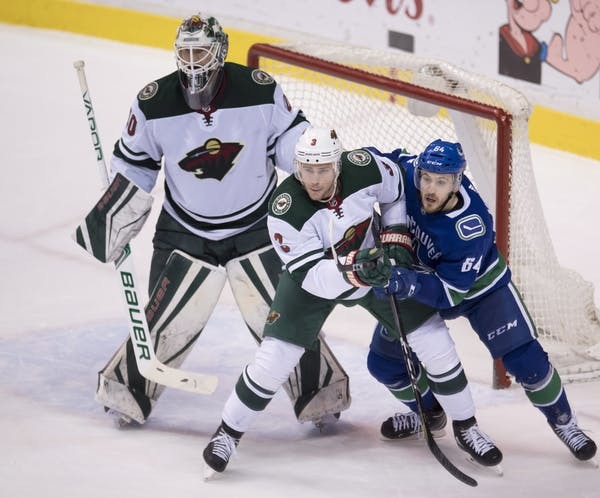 A 5-2 loss to the Canucks is one of the few blemishes on the Wild’s record of late, but the team has a chance to rebound against Vancouver when it hosts the team Thursday at Xcel Energy Center. Dubnyk will be back between the pipes after he was bowled over in the 5-2 loss to the Capitals Tuesday when Capitals forward Tom Wilson crashed the net en route to scoring a goal. Coach Bruce Boudreau called forward Matt Hendricks a game-time decision. The setback to Washington was the Wild’s first regulation defeat at home this season and with Thursday the first of five home contests over the next six games, the test against the Canucks is certainly a chance to recalibrate to make this stint at Xcel Energy Center a productive one. 1: Regulation loss at home for the Wild. 2: Points last game for captain Mikko Koivu. 6: Goals for defenseman Matt Dumba. 85.7: Percent efficiency on the Wild’s penalty kill. Vancouver has dropped three in a row, most recently falling 5-2 to the Islanders Tuesday. This is the last stop on a six-game road trip. So far, the Canucks are 5-6-2 are on the road. Forwards Bo Horvat and Elias Pettersson lead the team in 17 points. Pettersson also has a team-high 10 goals.